Acupuncture is one of the many skills employed within physiotherapy as part of an integrated approach to patient management. Physiotherapists must obtain a minimal Foundation Acupuncture Accreditation to be able to practice and qualified therapists commonly use acupuncture as an adjunct to other treatment. Acupuncture involves the insertion of very fine, sterile, single use needles into key points on the body to assist the body’s natural healing process, offer pain relief and regain the body’s equilibrium commonly disturbed with injury or illness. Acupuncture treatment should be tailored for each individuals needs at the time of attending the appointment. Acupuncture is ideally done once to twice a week for a minimal of four sessions to obtain maximum benefit. Most feel the effect immediately but this is not always the case. Needles vary in length from 30mm – 50mm and tend to be 0.25-0.30mm diameter. Being so fine they are often pain free when inserted and in situ. They should elicit a dull, heavy, aching sensation but should not be an unpleasant feeling. Needles are normally left up to 30-40 minutes depending on the amount and position of points used but can be left for longer or removed sooner if required. Within the clinic acupuncture is incorporated as part of your treatment and will not incur any additional charge. It is commonly used as an adjunct to other treatment to ensure that all aspects of your condition is treated effectively. Are there any negative effects of Acupuncture? On the whole no. Acupuncture is so useful as it has very few side-effects, if any. It is safe, clean and pain free. Some people can feel very tired post treatment but this is really a positive effect as it has stimulated the right response. Occasionally people can feel light headed post treatment as acupuncture can have an adverse effect on blood sugars but as long as you have eaten within the four hours preceding treatment you should not have this reaction. Very infrequently, it can aggravate pain but this is only temporary and again is not a negative. Feeling great is often reported post treatment which can never be a bad thing. Like any therapy, it has to be done by the appropriately qualified therapist but the needles used are single use and sterile, they are safely disposed in the clinic and they are inserted at appropriate angles and points to ensure that vital organs and structures are not damaged. The World Health Organization (WHO) recommends acupuncture as an effective, safe treatment for acute and chronic pain associated with injury or illness, problems associated with arthritis, systemic problems involving the respiratory, gastrointestinal, gynaecological and nervous systems and also anxiety and depressive disorders. The National Institute for Clinical Excellence (NICE) also advocates the use of acupuncture for persistent low back pain and headaches however there is much more clinical evidence to show that acupuncture is highly effective at treating a vast majority of conditions. Acupuncture is an ancient system of Traditional Chinese Medicine (TCM) first recorded in the Stone Age. The Chinese believe that the body contains invisible channels known as meridians, which circulate vital energy (Yang) and blood (Yin) to regain equilibrium essential for good health. If there is an imbalance, blockage or stasis of flow in these two systems then energy (Qi) can become stagnant, deficient or excessive resulting in illness or injury. Unfortunately there is little scientific research to support the TCM theories of circulating Yin, Yang, Qi and Meridans but it is very difficult to ignore centuries of empirical evidence. Acupuncture has been used in Western Medicine (WM) since the 19th century and subsequently much more scientifically based evidence has been produced in its support. Research has shown that acupuncture can stimulate the release of the body’s natural opiates, assist the natural healing response within the body and offers a powerful mechanism for modifying pain transmission within the central nervous system (CNS). 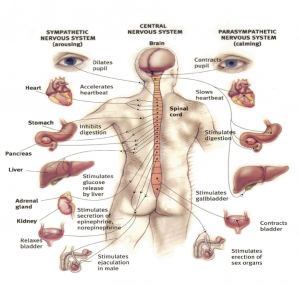 The central nervous system is made up of our brain and spinal cord and works with our peripheral nervous system (PNS) to receive input and control output to all parts of our body. 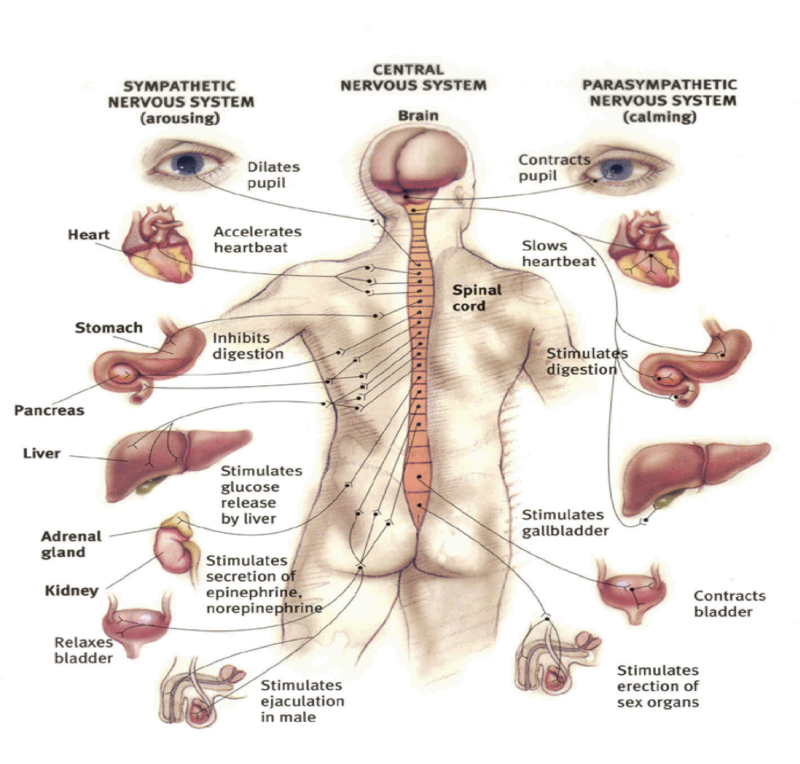 The Autonomic Nervous System (ANS) is part of our PNS and controls bodily functions that we don’t have to consciously think about such as heart rate, blood pressure, breathing rate, digestion process, temperature control and bladder/bowel function to name a few. We need to have a balance within the ANS to ensure that we are at an optimum physical level. The Parasympathetic and Sympathetic Nervous Systems (PSNS and SNS) maintain an equal balance within our organs and musculoskeletal systems but following injury or illness the ANS often becomes disturbed and homeostasis is compromised.This is the WM explanation of the Yin/Yang TCM theory. Have you ever heard of the saying ‘Fight or Flight’? This is our body’s primitive, automatic, inborn response that prepares the body to ‘fight’ or ‘flee’ from perceived attack, harm or threat to our survival. Sounds a little extreme to be discussing this in relation to injury or illness but this is a form of trauma to our body. Usually once the threat has been eliminated the body returns to its balanced state. The problem with a persistent/prolonged/reoccurring injury/illness or pain is that this homeostasis remains unbalanced. You may not feel it immediately but with time you may notice a change in your breathing and/ or heart rate, blood pressure may have changed, digestive function doesn’t work quite as well as it used to, your temperature control is out of sync, you feel more anxious or low in mood than normal, your sleep pattern has become disturbed or you general feel lethargic and unwell. These are all your body’s way of telling you that something is not happy. If you are seriously concerned about your problems you should seek medical help from your GP but it may be the case that medically there is nothing wrong, it’s just that your nervous systems are unbalanced. The application of a needle causes a local inflammatory response, which generates an immune response and assists tissue healing essential to stir up a stagnant healing response in chronic injury. If an injury is in the early stages it is usually better to avoid needling directly as this may produce more inflammation in an already irritated area. In this case it is often useful to needle the opposite limb or somewhere further along the injured area to aid healing but avoid aggravation. Each muscle, joint and organ of our body is innervated by a nerve originating in the spine within a spinal segment. Each area of our body has its own segmental supply, hence it is not unusual that we will treat your back when you come with foot pain or mobilise your neck if you have arm pain. Inserting a needle into an area will relay signals along the appropriate spinal segment and reduce the transmission of painful signals to the injured area. Pain receptors in the area needled will detect the introduction of the foreign body and transmit signals to the appropriate spinal level inhibiting the original pain signals being interpreted. This is known as pain gate theory and is very similar to the process that happens when we rub an area after we have just hit it on something; it stops the pain signals from the initial trauma reaching the neural structures that interpret the pain. Introducing a needle to an area will also cause a reflexive activity within the muscles innervated by that spinal segment. Similar to when we stand on a drawing pin (albeit less extreme with an acupuncture needle) signals are rapidly sent to the spinal cord where synapses are made with motor nerves that control our muscles. If the muscle is in spasm or ‘high tone’ synapses will be made to allow it to relax and if ‘low toned’ it will stimulate activity. This may help for those muscles that just don’t relax despite stretching or they just don’t activate despite working them hard. This is due to a disturbance in the neuro-reflexive activity and needs addressing in order for the muscle to function effectively. Needling can also affect the higher centres in the brain and induce highly effective analgesic pathways. The stimulus of the needle is transmitted along pathways to the brain and stimulates a process called Diffuse Noxious Inhibitory Control (DNIC). This involves the release of endorphins and enkephalins such as dopamine and serotonins, which are our natural feel good chemicals and pain relievers. 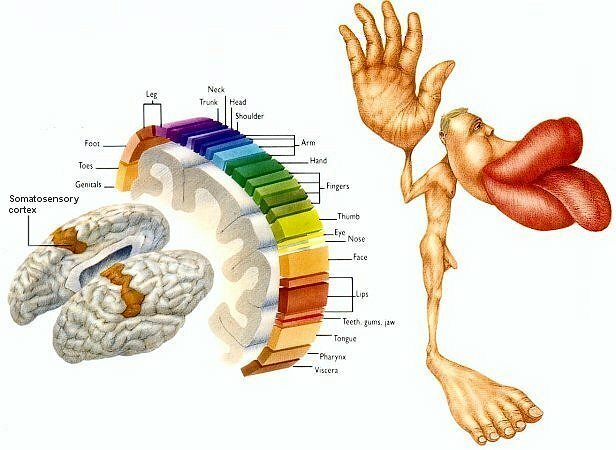 Our body also has a map of our body within the brain. This is known as the somatosensory cortex. Some areas are larger than others which is due to the amount of nerve endings we have in an area. The hands, feet and mouth are the largest represented areas, which may explain why a small paper cut always hurts a lot more than a deep cut on the leg! When we have an injury or an area of persistent pain this map becomes distorted and the body becomes confused as to how it perceives the area. Stimulation with an acupuncture needle can excite or inhibit these sensory areas accordingly and amend the way the body sees the area of chronically irritated tissue. In summary acupuncture is an excellent adjunct to physiotherapy. It can be used with acute and chronic injuries, persistent areas of pain, delayed healing, long term illnesses, general feelings of low mood or improved feeling of general well-being. It can be used as a stand-alone treatment but more commonly and more effectively it complements other physiotherapeutic interventions such as soft tissue mobilisations, joint manipulation, visceral treatment and exercise therapy. Acupuncture is not for everyone but it is a highly effective, minimally invasive and safe addition to management of a vast array of problems. Vanessa has also attended the association of acupuncture conference and presented a very successful case study she wrote after treating a soldier with a 7 year history groin pain. After six sessions of acupuncture with Vanessa his pain went.